I can understand why some disciples left Jesus after they heard this. Jesus seems to have drifted into the terrain of the weird, yet in fact He was plowing further into the soil of truth. Jesus had fed thousands of listeners on a hillside. He told His disciples that He was the bread of life which would bring not just temporary satisfaction but eternal fulfillment. He’s the bread that ends undernourishment of soul, the supply that can end spiritual starvation. Why? Because He delivers the truth, and nothing but the truth, straight from God the Father. Manna in the desert was great for a while, but 40 years of the stuff got oldy-moldy. But the bread of life is pure satisfaction. Believe it, He says, and you will have eternal life. If Jesus had stopped there He would have kept His large crowds. The “bread” I’m talking about, says the One who came down from heaven, is my flesh. If you want to have this life, you must eat my flesh. That’s not all. If you don’t drink my blood you do not have this life I’m talking about. But if you eat and drink, I will raise you up on the last day. “He who eats this bread will live forever” (Jn. 6:58). At that point, the congregation dwindled. This stuff was too hard. Uncomfortable. 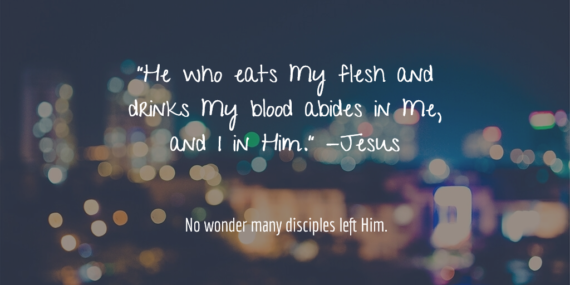 What could it mean for us to eat and drink Jesus? How do we consume a meal? First, we hunger. We have an appetite for nourishment, realizing that we need food. This must be true whether the food is tasty or bitter. We hunger for food because it is good for us, and often sweet to taste. Peter wrote that we should desire the pure milk of the word so we can grow from it. Second, we take it in. We put it in our mouths, we chew it, and we swallow it. Some of us heard our mothers say, “Chew your food, don’t just inhale it!” This is a cooperative venture between food and eater, between Christ and the disciple. We slow down and eat His words. We read, study, reflect, ponder. Meanwhile, Jesus functions as nourishment, delivering truth from the Father. Where do we go with this today? I got to thinking about this idea of consume. A “consumer” is one who purchases, who uses, who takes for himself. To “consume” is to imbibe or devour. A marriage is “consummated” through profound intimacy. The Son of God knew this teaching would turn away casual followers, so He pushed ahead and told the whole truth in expectation that a few of us would stay the course. I want to accept the invitation to His table every day, bringing with me all my emotions, frustrations, and hopes. I want to consume His flesh and blood, and nourish my hungry soul.